The August Horch Museum Zwickau is an automobile museum in Zwickau, Saxony, Germany. 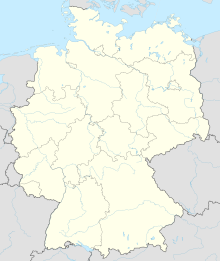 Opened in 2004, it covers the history of automobile construction in Zwickau, the home of Horch and Audi prior to World War II, and Trabant during the Cold War-era German Democratic Republic. The museum is housed within the former factory where August Horch established Audi Automobilwerke GmbH in 1910. Its owner and operator is a non-profit making company owned in equal shares by Audi AG and the town of Zwickau. ^ a b "The August Horch Museum Moves to a Worthy Venue". AudiWorld website. Internet Brands, Inc. August 25, 2004. Retrieved 25 October 2013. ^ Adams, Keith (October 2009). "Sublime to ridiculous". Octane website. Octane Media Ltd. Archived from the original on 13 February 2010. Retrieved 25 October 2013. August Horch Museum Zwickau (2004). Geschichte des Zwickauer Automobilbaus – Die Ausstellung. Zwickau: August Horch Museum Zwickau. OCLC 747040956. This page was last edited on 10 April 2018, at 08:52 (UTC).